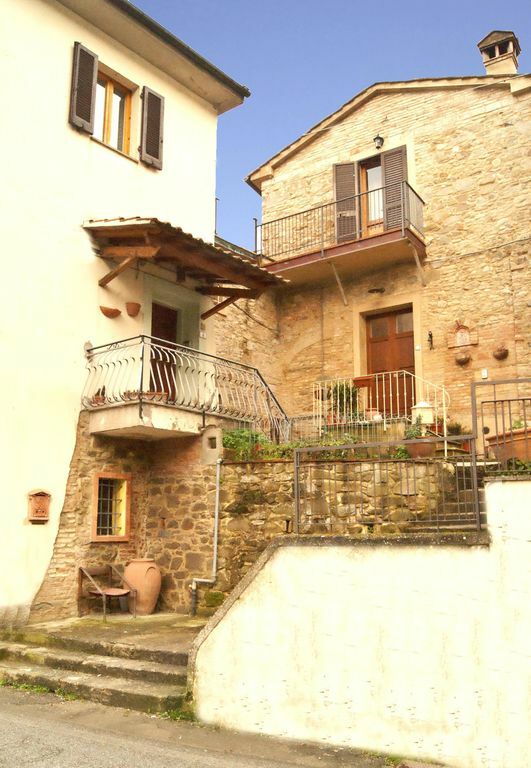 Large house divided into two apartments in the quaint village of Chianni. Ideal for visiting the most beautiful cities of Tuscany: Florence, Pisa, Lucca, San Gimignano, Volterra ... The village of Chianni is surrounded by beautiful hills and woods. In the village there are nice restaurants, bars and shops. It is located on the first floor and consists of a double bedroom, a bedroom with two single beds, a living room with fireplace, a kitchen with a dining table, a bathroom with shower. It is located on the second floor and consists of 3 bedrooms with double beds, a living room with fireplace and kitchen, a large terrace, a bathroom with shower. And 'possible to rent an apartment or both apartments as needed. Renting both apartments you have available is also another bathroom with shower. Parking is along the street in front of the house. We offer our guests the one free access to the large public pool of Chianni, situated in one of the most scenic spots in the country, about 1,5 Km from the house. For our guests of April and May, in weekly rates include tickets for entry to the museum of the Uffizi in Florence. Tuscany was beautiful. Pictures do not give it justice. You have to see it with your own eyes. The property was exactly as advertised and more. So much to see. It felt like home. The owner was warm, generous and welcoming. He was very helpful in setting up trips to places especially Venice. Any issues we had he was right there and solved them. If anyone is considering this place do not hesitate. The village was welcoming as well. We enjoyed the bakery a few meters away. A butcher shop oh and the wine of Tuscany. Great apartment, one block from the beach. Very clean and convenient, will stay again when i go back. The appartament was perfect, clean and very nice:). Owner very sincere and generous! We had an amazing trip to chianni. Our flight was delayed and the owner Leandro waited for us until our arrival at 2am in the morning despite having a job to go to in a few hours. We were made very welcome and plenty of suggestions of things to do that we would not have known about. House was very spacious and spotless. Local produce left for us by the owner, he could not do enough for us. Would definitely recommend. Perfect place, good location and nice people.